"Thank you for your patience considering the language barrier. We learned a lot!" Ramya, Saranya and Divya. 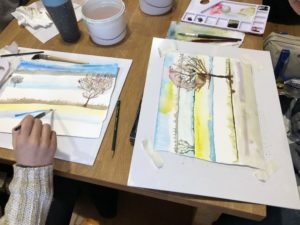 WATERCOLOUR WORKSHOP 10 November 2018. "the first time I've used watercolours, it was a great introduction to the medium. A very friendly and calm atmosphere." Rhuaridh. 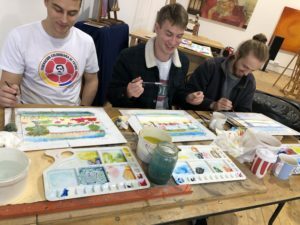 "I had a really enjoyable time at this watercolour class and learnt some simple techniques that can make a real difference to your painting. Would definitely do this again, thank you." Sharan. "Thank you I had a really enjoyable time. Very relaxing and great tips and tricks to learn for beginners in watercolour."Shivani. WATERCOLOUR WORKSHOP 17 November 2018 comments from those attending. "Really enjoyed the session, no improvements needed!" "Having not painted in years, I was anxious to come along and get stuck in. Gillian and crew were fantastic, had loads of fun and would recommend to anyone willing to give it a go. 10/10." "A great way to spend a few hours doing something different! Very enjoyable." What a great morning! I think we all had an excellent time at this lovely studio. Certainly learnt some great tips and feel fully immersed throughout. Highly recommend to groups doing something a little different." "I've never done anything like this before but I thoroughly enjoyed it, thank you so much!" Spring 2019 A series of new watercolour workshops are being planned. 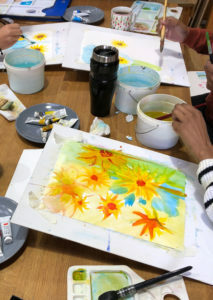 Included in the workshops depending upon what level, the introduction to watercolour Learning to mix colours using a limited colour palette and different combinations of the Yellow, Magenta and blue colour wheel. Using brush and water techniques. step by step, talking you through the process and painting a simple landscape exercise. Landscape, learning to paint trees, practicing with brush drawing. Building up the painting from far away to near using tones of the limited colour palette. Pen and watercolour first learning to use the pen and nib. Exercises to draw different lines and shapes. Paint a simple watercolour landscape using the techniques learnt, then when it is dry use the pen and ink to enhance the image. Also flower painting, urban scene and abstract. Gillian is a professional artist working in watercolour, acrylics and oil. Having taught and demonstrated watercolour in adult education and workshops. 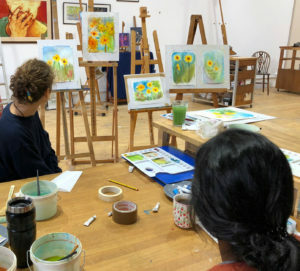 Gillian can show you a step-by-step and talk you through learning about the techniques with watercolour and how to plan a painting. Cancellations require 48 hours’ notice to receive a full refund. Cancellations less than 48 hours before will incur a 20% fee, or bookings can be carried over to the next workshop. Full refund given should the workshop need to be cancelled. For full T&C visit the website.